It was an intense year for Pope Francis, this Successor of Peter “who came from the ends of the world,” elected to the Petrine Chair on March 13, 2013. Here’s a look at it in snapshots, from the A of “accoglienza” [welcome] to the Z of “zanzare” [mosquitoes]. A of “Accoglienza” [Welcome]. To all: to young people wounded by unemployment; to the elderly “discarded and forgotten”; to the divorced who’ve entered into new unions and to all families “in irregular situations”; to the poor and those that live on the street, but above all to fugitives and refugees: vigorous was the appeal made during the Angelus on September 6, to “parishes, monasteries and shrines of Europe” to receive a family of refugees during the Jubilee of Mercy. And, by way of example, the Pontiff opened the doors of the parish of Saint Anne in the Vatican to a family of Syrian refugees, fleeing from the war. B of “Bangui.” Bergoglio rechristened this capital of the Central African Republic “the spiritual capital of the world,” opening the Jubilee ahead of time, during his trip to Africa in November of 2015. Unforgettable was the shot of Francis in the wooden Holy Door of the Cathedral of the Immaculate Conception, in one of the poorest areas of the world, where the clashes between religions cause suffering and deaths and where places of worship themselves suffer lootings and terrorist acts. It was one of the most moving moments of the whole year, according to Cardinal Nzapalainga and Nuncio Coppola. In fact, the Pope’s visit helped to restore a measure of peace and harmony in the country. C of “Confession.” The Sacrament where God’s Mercy is manifested. Therefore, Francis recommended to priests to carry it out with “pastoral dedication, care and attention,” not as “a torture” and even less so as an “interrogation.” The confessors – the Pope said – must be respectful of the dignity and personal history of each one, because “even the greatest sinner who comes before God to ask for forgiveness is “holy soil” to “cultivate.” “All should come out of the confessional with happiness of heart, with a face shining with hope.” Therefore, among the novelties of the Jubilee, the Pontiff decided to send more than one thousand Missionaries of Mercy who can also absolve sins reserved to the Holy See. And, in February, he wished to have the mortal remains of two “icons” of the Sacrament of Reconciliation, as Capuchins Saint Pio and Saint Leopold Mandic, translated to the Vatican Basilica. D of “Drugs.” The Pope spoke out strongly during his trip to Mexico from February 12-18 against drug trafficking, a “metastasis that devours” the country and which holds hostage young people especially, with false promises of power and earnings. Not to be forgotten, then, was his recent surprise visit, during one of the “Fridays of Mercy,” to the “Saint Charles” community for the recovery of drug addicts, of the Italian Solidarity Center, the Ceis, founded by Father Mario Picchi. It was a moment of genuine affection, during which Francis confirmed that “drugs are not conquered by drugs” and he encouraged the journey of those who fight against addictions. E of “Post-Synodal Apostolic Exhortation.” According to rumors, the document elaborated by the Pope, from the Propositions of the two Synods on the Family in 2014 and 2015, should be signed on March 19. Great is the anticipation of the text, especially on the thorny question of the Sacraments for remarried divorced persons. Above all, Bergoglio’s trusted theologian, Monsignor Victor Manuel Fernandez, Rector of the Catholic University of Buenos Aires, carried out the work on the document, which received several observations (some 200) from the Congregation for the Doctrine of the Faith. In regard to its publication, it was the Pope himself, during the return flight from Ciudad Juarez, who announced to journalists that it will come out before Easter. But for those who had some copies in hand of the draft , he spoke of a dense “bundle” that will commit several in the work of translation. G of “Giubileo” [Jubilee]. On the 2nd anniversary of his election, on March 13, 2014, during a penitential celebration at Saint Peter’s, the Pope announced his desire to proclaim an Extraordinary Jubilee of Mercy. After a year studded with various difficulties, between the uncertain Roman political situation that slowed down the works in the Capital and the fear of terrorist attacks, Francis opened the Holy Door on December 8, feast of the Immaculate Conception. It was a solemn ceremony, in the presence of Pope Emeritus Benedict XVI, although not very crowded given the Pontiff’s decision to “de-localize” the Holy Year so that every diocese worldwide could open the Holy Door in its Cathedral. 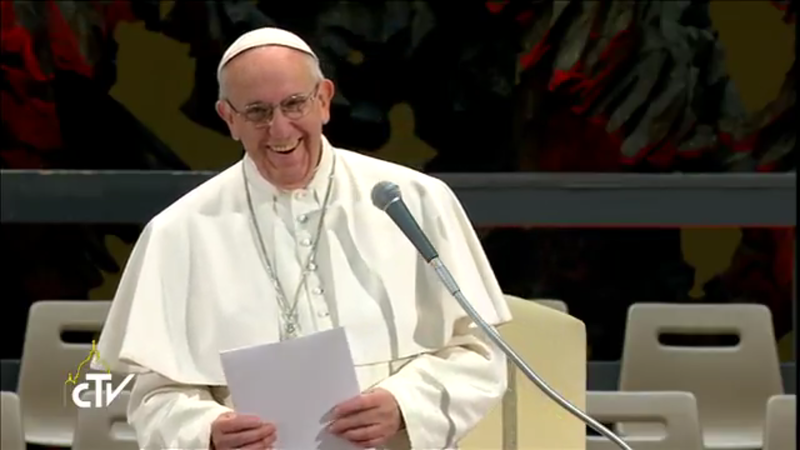 H of “HIV.” An age-old topic, addressed by the Pope during his November trip to Africa. Francis spoke about it at the U.N.O.N. the UN headquarters of Nairobi, requesting “easier access to medicines and to basic health care.” Then, on the return flight to Rome, the Pope was asked by journalists on the Church’s position on contraception. I of the “Internet.” A network of the ‘human face” was the Pontiff’s request in his Message for the World Day of Social Communications, when he stressed that the world of the new technologies and the vastness of telecommunications can constitute a resource, but also a place of “moral lynching.” Francis then adhered to the Keep Lent initiative to proclaim the Gospel through the social networks during Lent, and his Twitter account @pontifex has recently exceeded 27 million followers. L of “Laudato Si’.” The “green” Encyclical, published on June 18 in which the Pope criticizes the phenomenons that devastate “our common home,” from the human and environmental point of view, proposing guidelines and actions to save the earth, which has “become an immense deposit of filth.” Applauded and at the same time criticized, the document remains a milestone of Bergoglio’s teaching. O of “Ostpolitick.” Through a network of diplomatic work, carried out behind the scenes, Francis gave a strong impulse to the “thaw” between Cuba and the United States, breaking the embargo that lasted decades after the end of the Cold War. Presidents Obama and Castro attested to this themselves. But the Pope also created a “corridor” with Moscow, the “third Rome,” through his meeting with Kyrill, an event that has never before happened in history; he restored relations with Turkey, where the Vatican Ambassador was readmitted after the crisis caused by the phrase on the Armenian genocide. He stretched out his hand to China with the long interview in the Asia Times, in which he says he esteems the people of the former Heavenly Empire, which has in its pocket the keys of the global economy, inviting to reason beyond the logic of Yalta. P of “Pizza.” A desire he has, which he has always admitted in different interviews. To the question of French journalist Caroline Pigozzi, in his conversation with Paris Match, about what he misses most from his life before, Francis answered: “to go out and eat a pizza …” Something that was heard in part when he went to CeIs where he tasted a small piece, as attested by the photo released by Vatican expert Francesco Antonio Grana. R of “Reform.” The reform of the Curia continues and the consolidation of some dicasteries with the announcement, at the end of the Synod, of the creation of a Congregation for “Laity, Family and Life.” Introduced also are new norms for financial administration, which also involves the Congregation for the Causes of Saints, and new regulations, for instance, for the Commission for the Protection of Minors. S of “Synod.” After the troubled one of October 2014, the second Ordinary Synod was also a difficult test for the Argentine Pontiff. In addition to the discussions in the Hall, there were also some disagreeable situations, such as the stir over the letter of 13 Cardinals (not confirmed by all), and the news from an Italian daily of a phantom tumor in the Holy Father’s brain. T of “Human Trafficking.” Pope Francis is intensely committed to fight against this plague of the modern world. So much so that the Pontiff gathered, at the headquarters of the Pontifical Academy of Sciences in the Vatican, the leaders of the different religions to sign a joint document geared to defeat every modern form of slavery by 2020. U of “Unity.” He took the first historic step on February 12 in Havana’s airport in Cuba, when he embraced Moscow’s Patriarch Kyrill and signed a Joint Declaration. Then with the Jews: like John Paul II and Benedict XVI, Francis went to the Synagogue, confirming the common roots of brotherhood. With the Muslims: the Pope’s visit is expected to the Great Mosque of Rome that, according to rumors, is imminent. In the meantime, a Vatican delegation has renewed relations with the prestigious Sunnite institution of al-Azar, going to Cairo to invite the Great Imam to an audience in the Vatican.